On the agenda today we have a cigar I’ve been waiting to review for awhile. This particular stick was sent to me in a trade and I’m glad it was cause I had none left to review! lol. Seems I had smoked all the ones I had and forgot to save one for a review… oops! But despite my silly oversight, I managed to get one to review for everyone’s enjoyment! 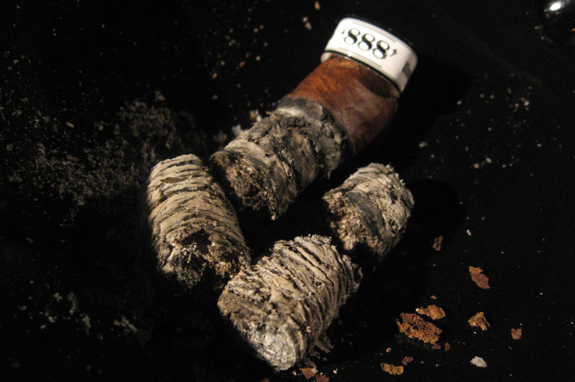 The cigar I’m referring to happens to be an Illusione ‘888’ Slam. 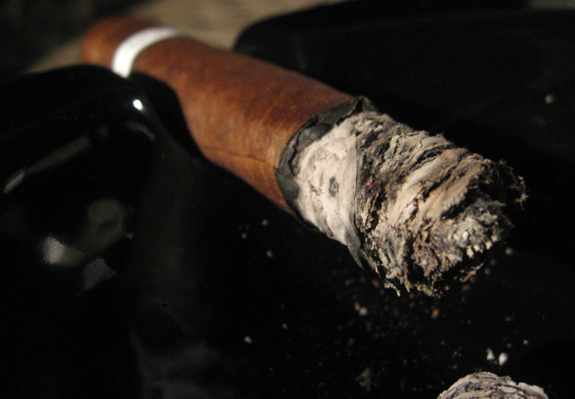 This particular cigar is not entirely full production at the time I write this. Dion Giolitto, of Illusione Cigars, released this as a prototype blend and it seems it was well received all around! Although the name is mostly the same, the Illusione ‘888’ Slam is not the exact same blend as the Illusione ‘888’. The main difference is a single type of filler leaf that was removed to help make the “bench” press process possible. 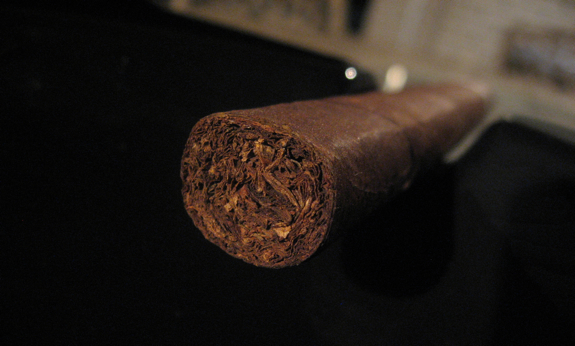 The bench press style of this cigar is where the “Slam” in the title comes from. 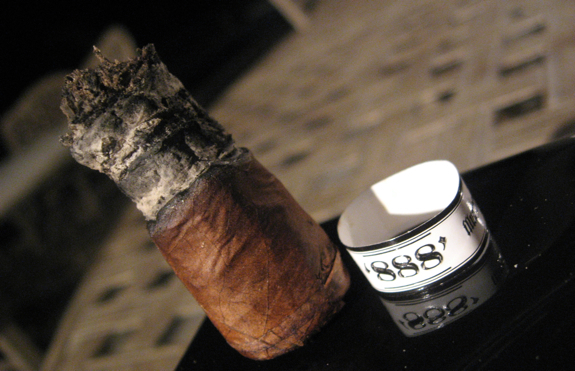 The Illusione ‘888’ Slam is a Nicaraguan Puro, meaning all the leaf in the blend is sourced from Nicaraguan tobacco. The one thing that doesn’t come from Nicaragua in this cigar is the production, it’s actually rolled in the Honduras factory. As with each of the Illusione blends, they have a little catchphrase associated with each blend. In this case, the catch phrase is “Neccesary and Sufficient”. The name and numbers have roots in Dion’s faith and I would recommend reading about the meaning on his website. 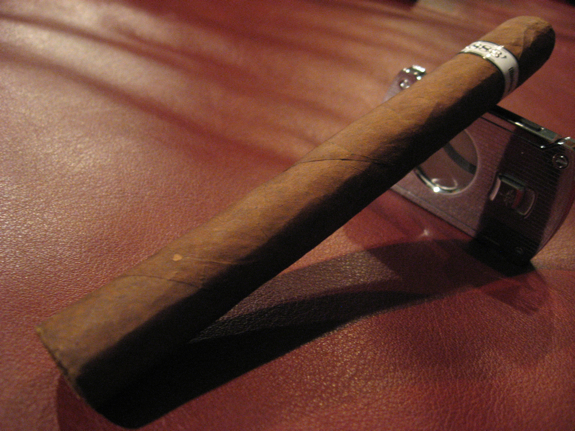 The addition of the meaning behind each name is a very interesting addition in the cigar world. •	In the last third the wrapper actually stopped burning and I needed to touch it up a couple times, this might have been due to the 94% humidity outside? 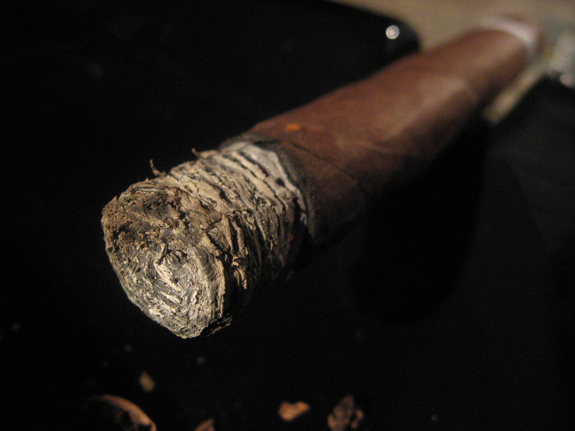 •	I had pure butter fingers with this cigar tonight and kept losing my ash! Oops! •	The spice settles down after a couple inches and left me with mostly earthiness and some cedar, the retrohale remains super tasty! •	As I get into the last couple of inches the spice is making a big comeback, each draw gives a very interesting texture on my tongue, it’s thick and chewy and almost feels like I just sprinkled black pepper right on my tongue. Very cool! The Illusione ‘888’ Slam was awesome! That just about sums it up! Do I need to continue? 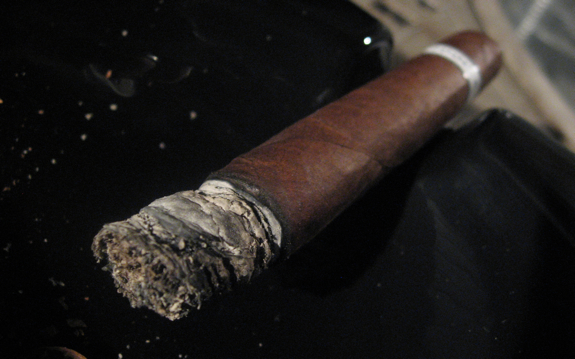 ok fine… The most enjoyable part of this cigar that I can’t emphasize enough is the retrohale. If you don’t run the smoke through your nasal passages I think you would be missing out on a huge part of this cigar. You would probably think that I’m crazy and the cigar was just ok. Without the retrohale, it’s an ok cigar. But with it, it’s fantastic. The burn was nice and even for the most part and draw was spot on. 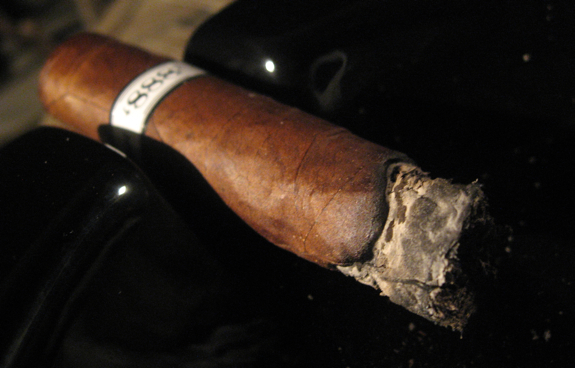 The price is a tad high but this is a long vitola and makes for a fully enjoyable experience. the price may make it hard for a lot of people to opt for a full box, but definitely reach for a 5-pack if you can, they are worth it in my opinion. 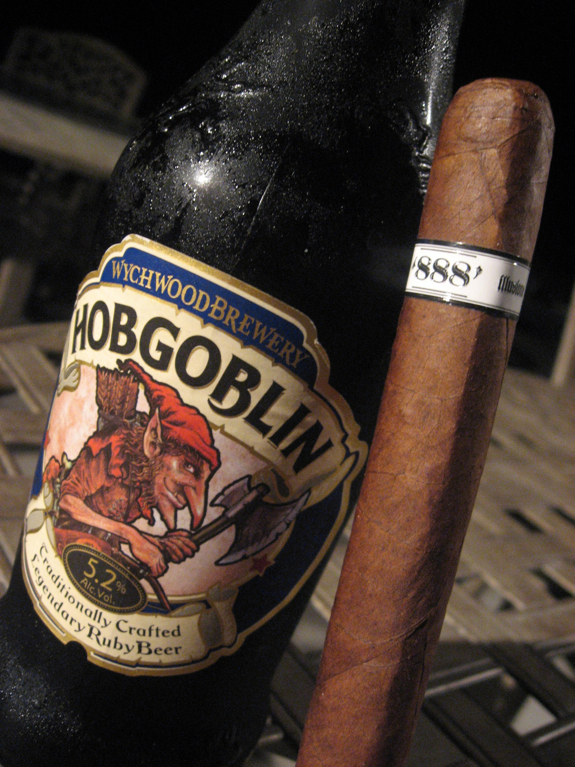 Tonight’s pairing choice is from Wychwood Brewery in Oxfordshire England and is called Hobgoblin. Seems I’m picking up a lot of English brews lately, not on purpose though, it just seems to be what I find at the store. I actually posted up a full review of this beer awhile ago during the colder months, you can read it here. The beer has some seriously tasty hoppy bitterness and lots of malt. On top of that you can pick up some light berry flavors. 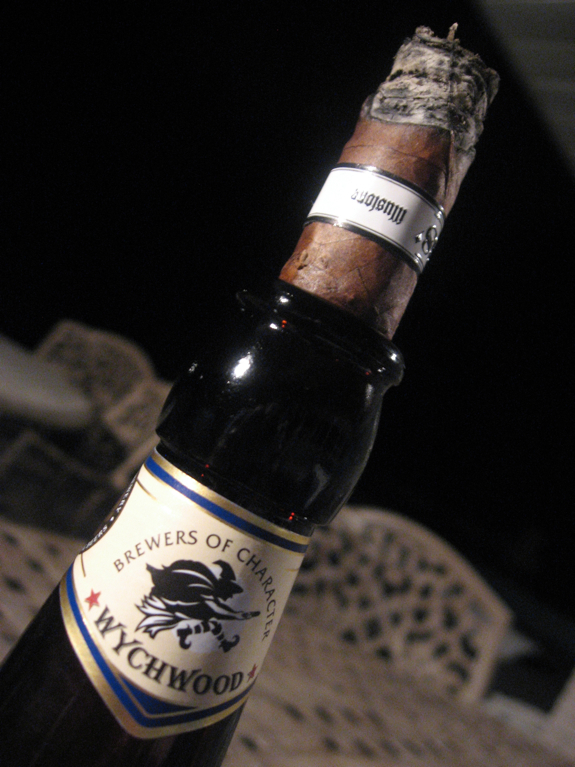 It’s definitely enjoyable on it’s own and I’ve found it to be an excellent pairing with quite a few cigars as well. It paired nicely with the Illusione ‘888’ Slam and I think the main reason for this is because of it’s straightforward profile. It doesn’t have too much in the way of other sweet flavors and prides itself as a traditional Ruby Beer. This makes it a good palate cleanser and doesn’t mess with the cigars flavors very much, allowing you to enjoy the cigar for what it is. Other great pairings here would be a full stout, my favorite tawny port or a nice cup of coffee. Sounds great, Daniel. Also sounds like it’ll be hard to find. It may be a little hard to track down and since the blend is very similar to the 888 it may not be worth it to the average person right now. either way it was a fun stick to smoke. It’s a new trend. The beegar! Awesome D! I have to agree the illusione regular lines are the best. I wish he would slam the -88- and the -mk- It is just the novelty of a box press and a little less filler. 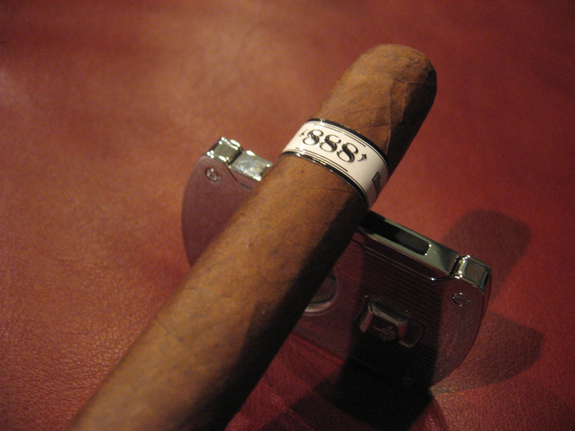 The -888- is a bit big for my daily smoke, but it would be for a nice evening when it gets cooler down here… Thanks!